This delightful young lady is Evelyn. She is the daughter of Beth and Adam, friends of the Lovebunnies. Evelyn and Adam recently attended a campfire party at the Lovebunnies' house, but alas, Evelyn was less than enthusiastic about sitting outside in the cold, surrounded by scuffling dogs and loud fireworks. She did, however, enjoy playing with Papa PJ. Loie took some pictures, and Bucky sent them to Adam along with a letter refreshing Adam's memory of the names of all the Lovebunnies' animal friends. Adam wanted to know their names because he and Evelyn will write a story about what Story Bear (Evelyn's friend from preschool, shown here sitting in her lap) did over the weekend. Bucky thought Evelyn and Adam might be interested in the story of how Papa PJ came to live with the Lovebunnies. Bucky searched the Lovebunny Letters, thinking he would send Adam a URL where the story could be read. But to his dismay, Bucky found no trace of Papa PJ in any letter! Could this be? Was it possible that the world didn't know the story of Papa PJ? Apparently so. That grave oversight is hereby rectified. What follows is the text of Bucky's letter to Adam. Evelyn is sitting on a bear who, until her last visit, actually had no name. That is rather odd, as Bucky names pretty much everything he sees. It's a habit he acquired from his mother, who liked to make up names. Bucky has even been asked by friends to name things; ask him about Pokey Spot the next time you see him. So it remains a mystery how a bear could live at Loie and Bucky's house without having been named. Evelyn named the small white bear Ribbon Girl. Then she sat on her. The larger white bear's name is Prinzy, short for Princess Bear. Prinzy had a tee shirt emblazoned with the word "Princess" and several small gems. The tee shirt has disappeared. Bucky thinks it might have been loaned, or given, to Niece Alyssa, but he's not sure. But Prinzy does still have her halo, and she graciously allowed Evelyn to wear it during her visit. We hope Evelyn realizes what an almost unprecedented honor this is. Princesses don't share well. And of course, last but certainly not least we remind you--although we're sure you don't need it; we're just being excruciatingly polite--that the big brown bear is named Papa PJ. Bucky did not name Papa PJ. That's the name he came with. It's on his ear tag. The tale of how Papa PJ came to live with Loie and Bucky is a heartwarming Christmas Story, one that never fails to draw an appreciative "awww..." from young and old. Let's see if it works on old curmudgeons, too, shall we? Bucky and Loie always give drawing supplies to both Niece Alyssa and Nephew Nicky for Christmas presents. Amazingly, both children still seem to appreciate them. It was about five years ago that Loie and Bucky were at the stationery store for their annual drawing pads and pencils Christmas shopping, when Loie saw Papa PJ for sale. Bucky watched her stop right in her tracks, and just stare at the world's biggest teddy bear. "It's my dream," said Loie. Bucky looked at her inquiringly. 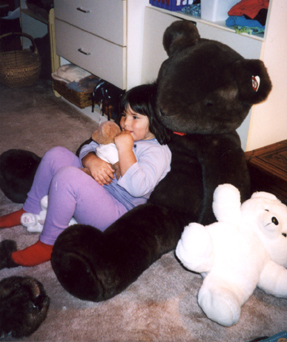 "When I was little, I used to dream about having a huge teddy bear, just like this. I mean, literally. I would have dreams with a huge teddy bear in them. I wanted one so much." Bucky looked at Papa PJ's price tag. "Well," he said, "This is a nice bear, but he's pretty expensive." Loie agreed that it would be a lot of money to spend on a bear. Bucky asked the sales clerk whether there was any chance Papa PJ might be marked down if he wasn't sold soon. It was getting close to Christmas, and Bucky thought the store would want to sell Papa PJ before Christmas. After that, he'd be much more difficult to sell. "Oh no," said the clerk. "We'll sell him, no problem. He won't ever be marked down." Loie and Bucky were mightily disappointed, but they knew they just couldn't afford to take Papa PJ home with them. But Bucky didn't give up hope. I bet you know how the story goes, don't you? Bucky thought he probably knew a bit more about Carroll County than did the store owners. He visited the stationery store several more times before Christmas, of course on his own, without Loie. Each time the clerks assured him the bear would soon be gone. But Papa PJ languished on his chair, unsold. It took almost until Christmas Day, but, sure enough, with only two days to spare, Bucky called the store. "Has the big bear been marked down yet?" he asked. "Oh, gosh, it just was," said the clerk. "This is the man who's been asking about it," said Bucky. "Don't sell it to anyone else. I'll be there in ten minutes. With cash." "Well, I don't know," said the clerk. "If someone comes in..."
"Don't you dare," said Bucky and raced out the door. Luck was with him. Papa PJ smiled at him when Bucky got to the store, and was grinning out loud as they walked triumphantly out the door. Bucky stood on the street corner for a few minutes, holding the gigantic bear in front of himself, waving its arm and calling "Ho ho ho, Merrrrrry Christmas" to people passing by. They thought it was Papa PJ wishing them merry Christmas! Papa PJ had to hide in the cellar for almost two days, but he didn't mind. He knew what was going to happen on Christmas Day. And he was right. When Bucky brought him up, and presented him to Loie, you never saw anyone as happy as the two of them. Well, all three of them if you count Bucky, who may well have been happiest of all. Because Bucky's mother may have taught him to name things, but Bucky's father taught him to love a good sale.